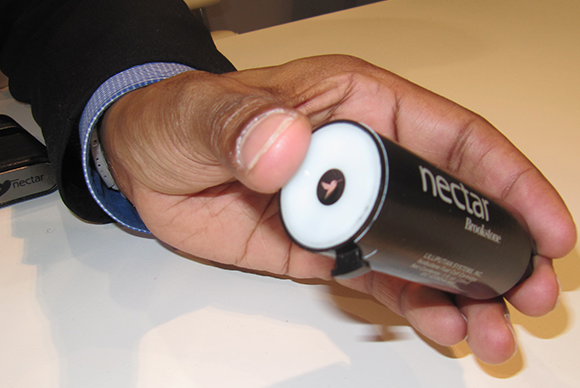 LAS VEGAS— Portable power devices for recharging batteries on the go are plentiful at CES this year, but the Nectar Mobile Power System blows them out of the water with its innovative design. Nectar can recharge a smartphone, tablet, or any other device that draws its power via USB without needing batteries or a wall-charge of any kind. 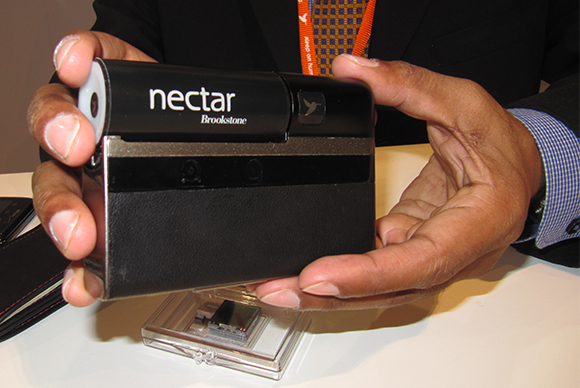 The Nectar unit is essentially a small portable generator for your mobile devices. It’s powered by a single Nectar Pod cartridge, which uses butane fuel and an advanced silicone chip technology. Each Pod packs 55,000 milliwatt hours of energy, which can fully recharge most smartphones 10 to 14 times, or most tablets 2 to 3 times. If you fully recharge your phone once a day using the Nectar system, the cartridge will last for two weeks; realistically, it will last for much longer. When a Pod dries up, just take it to an electronics recycling center and attach another one. You can easily keep track of the Pod’s fuel status through the Nectar’s LED light system. Green lights indicate a full or mostly full Pod, yellow means it’s running low, and red means empty. Or, just detach the Pod and look at the top of the cartridge—you can actually see the liquid butane fuel inside. Nectar Pods use no energy at all when not in use. The brains behind the device is Lilliputian Systems, a consumer products company that has been investing in silicon chip technology for around five years. The company wanted to create a power station for travelers that was lightweight and compact, and—most importantly—offered an easy way to power up a device when no wall outlet is in sight. Nectar is fully compliant with TSA and international travel standards, so you can bring it with you in your carry on bag, on camping trips, in the car, or anywhere else. Such a cool product comes at a hefty cost: The main Nectar system costs $300 and includes one Nectar Pod, and each additional pod costs $10. Cult of Mac estimates that this total cost equates to roughly $1 per iPhone charge. But the high price isn’t exactly unexpected, given its status as a brand-new charging technology.